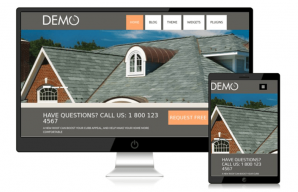 You need an absolutely simple, clean but catchy looking on wide screen, tablet, and mobile devices? Badge Free is fully responsive, meaning your ImpressPages site is going to look good on whichever screen it is. Need a simple, clean look for your ImpressPages site? We've got a free themes that will get you there. 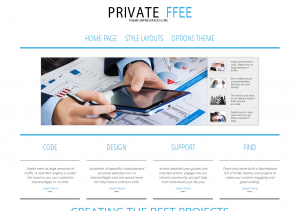 Private Free is a Simple, Clean and Responsive theme which adapts automatically to your tablets and mobile device. 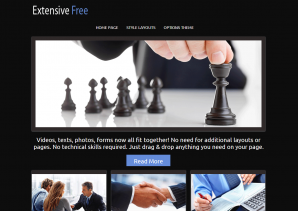 With a Private Free theme you often get a good start on a web site project. Long pages are looking good on this theme. StanleyIP is a theme coded by BlackTie and ported to ImpressPages, The Portfolio is based on the Gallery Widget. Extensive Free is dark and elegance ImpressPages theme. Designed specifically to meet to many kinds of business projects. 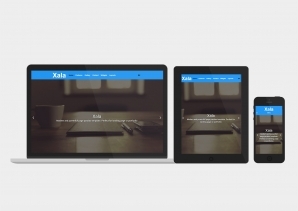 Theme with mobile and tablet responsive design. Club Free is a beautiful, easy to use & fully customizable theme. The Theme is a flexible foundation with fluid grid system that adapts your website to mobile devices and the desktop or any other viewing environment. Is just a simple template, fully responsive. 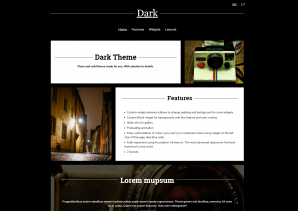 This dark Stimulus Free theme really rocks and is definitely one of the best. 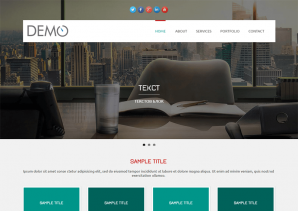 Stimulus Free theme is minimalistic theme perfect for businesses, creatives, and individuals. 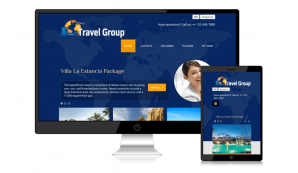 The theme is responsive and a flexible foundation with fluid grid system that adapts your website to mobile devices and the desktop or any other viewing environment. 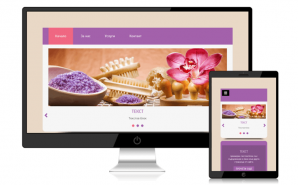 Is a template suitable for spa salons, is fully responsive. Is made upon http://www.templatemonster.com/free-templates/free-website-template-spa-salon.php with my modifications. 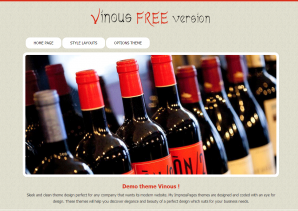 Vinous theme gives everyone a surprisingly easy way to create a unique site for any company. 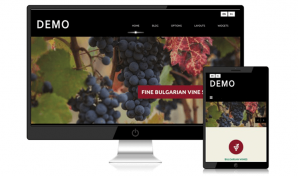 Vinous responsive themes are designed to work seamlessly for all desktop and mobile devices. ImpressPages theme based on the Start Bootstrap theme Freelancer originally was thought as a one page freelancer portfolio created by Start Bootstrap. This theme has several default color scheme combinations but can be easily updated using less and bootstrap with the included less files, it includes its own jQuery version. It has configurable links, 4 different layouts, color schemes and integrates with different languages, it also has overrides to allow some components to work better with Bootstrap (including the Nested Columns plugin). 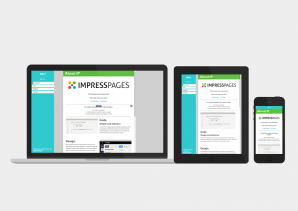 GradePro is a fully-responsive ImpressPages theme. 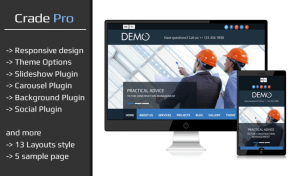 Its plugins, Page Templates and Theme Options give you full control over your website. Let us help you make your website simple, beautiful and professional. 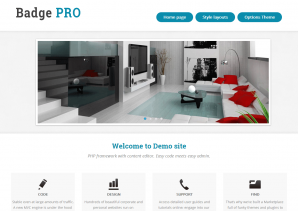 Let your website sparkle with sophistication with Ideal Pro Impresspages theme. It boasts its full-screen slider that allows you to lay greater emphasis on your splendid photos and other creative content. This modern and flat theme is designed based on the latest bootstrap technology. 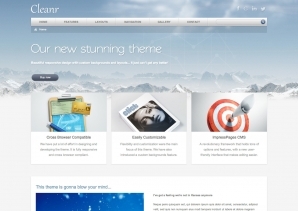 An impressive highest quality theme with included slideshow plugin. 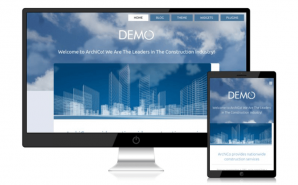 Fully responsive and complete. PSD File included. 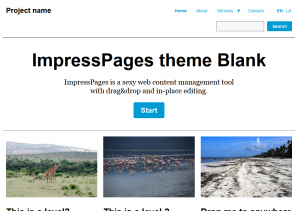 The most advanced ImpressPages CMS theme. With custom slideshow plugin included. You will also get the source PSD design files. One Page Factor is a single-page theme that displays all the essential features of your website on the home page. It makes easy for the users to get all the required information within a single page. 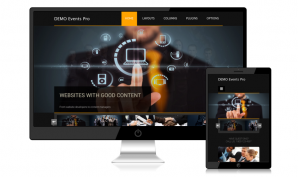 One Page is a professional and outstanding responsive business ImpressPages Theme. One Page was built keeping the simplicity of design in mind. The whole interface of the One Page Theme is clutter and the place for the most important business content is provided. Firstly, so why One Page? A One Page website aims to provide the perfect (could read minimum) amount of information for a user to make a decision and act upon it. This single page website has no additional pages (like about, services, contact) and tries to remove as much “clutter” as possible, focusing the user’s attention to the most important content. You must use Design Options to edit Header menu. Accepted Additional Pages I want to add that some additional pages are acceptable but need to follow this rules: the page contents are not relevant to the home/parent One Page website. The links to these additional pages are not visible in the website header – distracting the user from the One Page reading experience. These page links are normally associated with the website left menu. Entire Pro is a flat, elegant & multipurpose theme for your business! With this elegant theme for Impresspages CMS, your website will be easy to use and will look great on any mobile device, as mobile-ready designs adapt to various screen sizes. Modern clean and solid theme. With unique features. 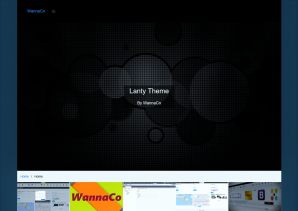 Theme Roof is a powerful and user friendly theme. 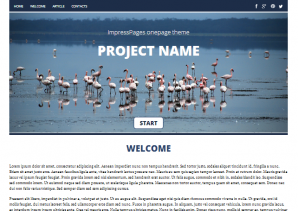 A versatile ImpressPages theme perfect for creating portfolio or corporate pages, and much more. Agriculture may seem an area of life that is far from technology and modern, fast-paced world. 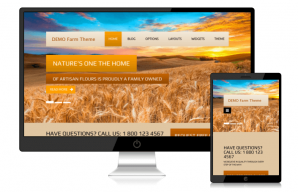 Modern Farm ImpressPages theme is designed for the best presentation of organic farming companies. This theme uncover how awesome what you do is and how much value it can bring for those who care. Simple, beautiful single page theme with custom features. Drip is the most powerful theme I have ever built, and quite possibly the only theme you will ever need. The theme include five individual plugins - Slideshow, Carousel, Testimonials, Background Image and Social icons. Theme Modern Pro is a classy, sophisticated and clean, with expansive design that extends in the wide space. The Theme is a responsive which is perfect for any business and portfolio site. Theme Modern have two integrated plugins - Backgrounds Slider and Social Networks. The Theme includes four layouts and three different columns design. 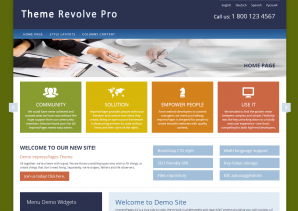 Revolve Theme allows your visitors to see several content items at a time and all that in stylish way. jQuery Carousels allows your visitors and you just that, to see several content items on very nice way which will fit into your theme perfectly. Mobility is the battle cry of this generation, a Revolve Theme gives them just that. The responsiveness of this theme is complemented by its compatibility with mobile devices. This theme allows you to highlight your company and staff, the services you offer and the projects you’re currently involved in. With Stimulus Pro version you can easily change the overall appearance of your site by editing your site's layout, themes and colors. The theme include animation effects an homepage, as well as multiple color swatches - black, blue, gold, green, grey, lime, orange, pink, red, turquoise, violet and yellow. 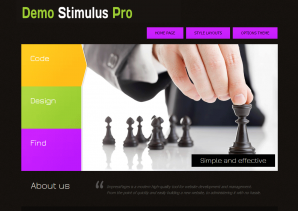 Stimulus Pro provides aditional two different layouts - right and wide style. 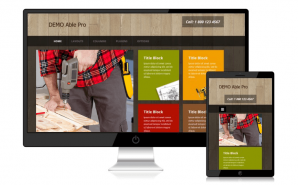 Download nice responsive website template and simplify your work on your new project. 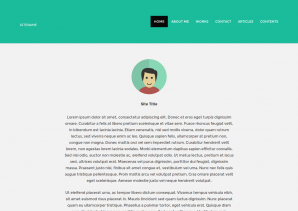 Our templates are perfect for business and personal websites. Beverage is a stylish and lightweight theme crafted for websites, or personal blogs. A modern layout and quick customization options make it the perfect choice. Beverage Theme presents your content with perfect elegance. Esteem is a clean, simple, flat design responsive ImpressPages theme that can be used for business, blogging, portfolio or any type of site. 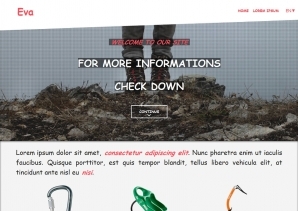 Camping Theme is a responsive flexible foundation with fluid grid system that adapts your website to mobile devices and the desktop or any other viewing environment. 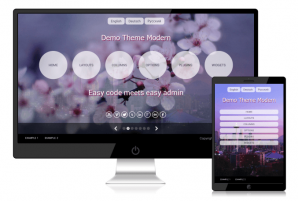 Theme features 7 Template Layouts, Slideshow Plugin, Social Plugin, 2 Menu Positions and Theme Options. 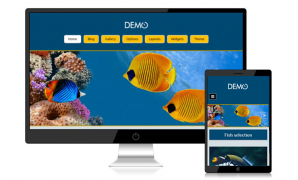 The Aquarium ImpressPages CMS Theme is designed to help aquarium store owners make a striking impression with a professional website that beautifully presents your aquarium business and convinces visitors of your knowledgeable and trustworthy service. 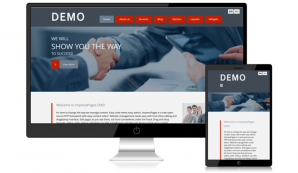 Just replace the demo content with own text and photos to get your website online fast. You can easily change the color scheme with options panel. This template is fully responsive, so the visitors of your site will be able to browse it from both desktops and smartphones. Sea colors and large hero area nicely support the idea of aqua related sites. Lanty is another great crisp theme with Offline support(Progressive Web App), with many features just like the Flat theme including a few more gallery effects, gallery lightbox image grouping for an enhanced navigation. Offline is possible now!!!! And Android users will be prompted to add the site or app to their home screen. A built in Blog Layout that Pulls articles from child pages under menu3, ajax like loading articles with pagination and a beautiful automatically created side navigation menu. One page scroll Layout with an automated side navigation menu and Both Blog and Single page scroll have scrollspy effect. Enjoy...!!! Sauna is the best theme for hair salons, wellness centers, SPA and other health and beauty related websites. It fits perfectly on various displays and resolutions on the tablet, iPad, iPhone, and the General small mobile devices desktop. 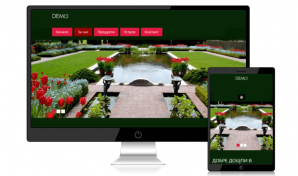 GardenShop is a stunning theme for ImpressPages CMS. It is built for easy reading. GardenShop have a spacious and full width. GardenShop is a sleek, all-in-one solution for businesses. 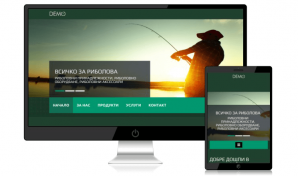 Fishing Theme for ImpressPages CMS is great and quality assured, it's designed to impress. The theme is cross browser compatible and responsive thus accessible from any browser and device your users choose. WoodStore Theme based on Bootstrap. 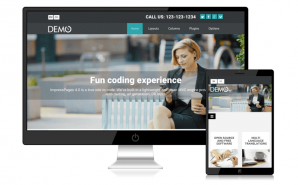 Flexible with Bootstrap fluid grid extended system that adapts your website to mobile devices and the desktop or any other viewing environment. 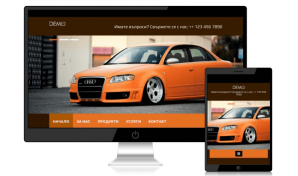 CarTuning is a fully loaded Bootstrap 3 starter theme for ImpressPages CMS. It's homepage with full width image slider. 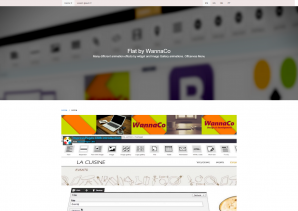 You can use this theme to create larger, multipurpose websites using Bootstrap 3. Babysitter theme is a carefully styled Bootstrap theme for ImpressPages CMS. It's perfect for personal or company websites. 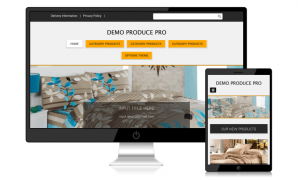 This theme have 13 layouts pages including a home index page. Modern design with a subtle splash of color (which is easy to customize, especially with options). Auto Parts ImpressPages Responsive Theme is specially designed for auto store, auto spare parts, cars & bikes and tools store. Auto Pars ImpressPages theme is looking good with it’s colors combination. It is very nice with its clean and professional black look. Flat is a neat and minimalistic theme with multiple animations, TinyMCE Templates and FontAwesome icons within the Formats section. Animations can be added by widget using the included widget animation plugin. The widgetanimation adds a menu to the widget just like when you choose a skin. The Image Gallery has 35 different skins, some with slideshow and slideset animations, overlay effects as well for a gallery view. Slideshow skins are either static or autoplay. The Image Widget has 2 additional skins, a cover and a parallax. Form fields that you name Date trigger a datepicker, this is also available in Spanish and can be easily extended to other languages. The Heading widget can be centered. This description could go on, but for now just browse around the theme. The SEO meta title and description also helps rendering your site in twitter as a nice Summary Card with Large Image. Don't forget to install the social media page image plugin. 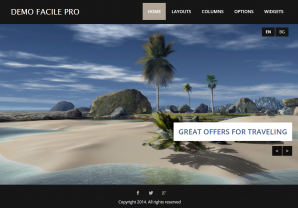 AblePro is a responsive and professional ImpressPages template with two own plugins. 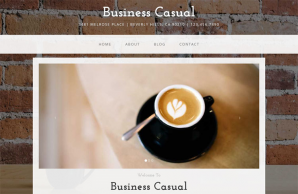 The theme is a great option when you want website with something more descriptive. 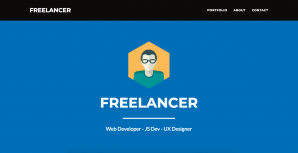 AblePro is the perfect theme for individual portfolios, writers, artists, designers, agencies. Creative Multi-Purpose Responsive ImpressPages theme. Stunning visuals and great flexibility. A unique testimonials plugin is included. Supports Search and PageImage plugins from the market. PSD files included. 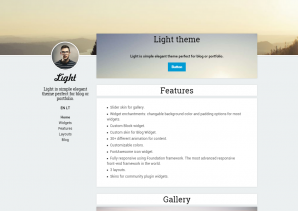 Light is simple elegant theme perfect for blog or portfolio. Recommended diets, recipes and different snacks. If you need publish information about food, this theme is for you. Corpora Pro is a sleek and professional theme for business sites. Grab your visitor's attention immediately with the prominent and flashy jQuery slider plugin and perfect features with carousel plugin. 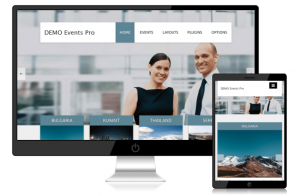 EventsPro is a great looking theme that has a very clean and minimal design. This theme include 7 styles layouts + 5 plugins. Now you can have many possibilities for your site. Also, You can change many options such as element’s color, Backgroumd pattern, font family etc… easily via ImpressPages Design Option panel. Invade Pro is an incredibly beautiful and fully responsive Bootstrap Theme for any type of creative professionals. 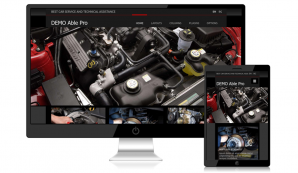 Invade Pro has easy to customizable options and works on all main web browsers, tablets and phones. I believe it will save your precious time and gives trendy look to your next web project. Insurance Pro Bootstrap theme is developed with mobile first approach and designed for business, portfolio, personal and other type of website. The theme is a flexible foundation with fluid grid system that adapts your website to mobile devices and the desktop or any other viewing environment. Merge Pro is developed with the help of Bootstrap. Fully responsive, feature packed and easy to customize theme. Includes four plugins - Slider, Carousel, Testimonials and Social Icon. Produce is a Premium Responsive ImpressPages template. 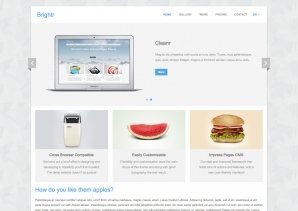 It's extremely customizable, easy to use and fully responsive for Simple product plugin. 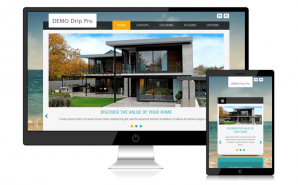 Real Homes Easy is a simple, fully responsive modern theme. The template provides a good base to start your own personal or company website. 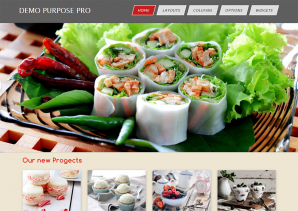 Purpose Pro is an amazing ImpressPages theme, great solution for any type website. The theme comes with left or right sidebar, column and wide styles, customizable Option panel, Slideshow Plugin and Social Plugin. Theme Fortunes Pro is coupled with advanced functionality with Slider plugin and Social plugin. Let me help you make your website simple, beautiful and professional. 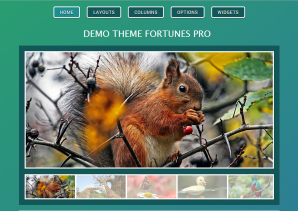 The Theme Fortunes Pro is a responsive theme, which means it adapts to the device on which it's displayed. The theme cares for your content so it looks great. FacilePro is a Simple, Clean and Flat Responsive Business ImpressPages Theme which adapts automatically to your tablets and mobile devices. 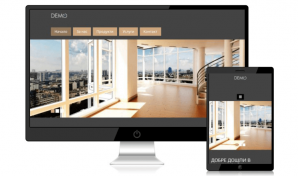 Theme include elegant Slider Plugin with a beautifully designed. Customizable through the options panel, so you can modify the design and layout website within minutes. Foundation responsive clean theme with home page slider and custom plugins and 4 layouts. 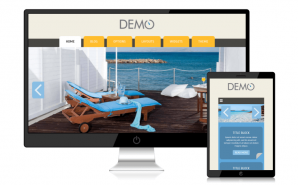 Package 103 include a Perfect, Clean and Flat Responsive Business ImpressPages Themes which adapts automatically to your tablets and mobile devices. 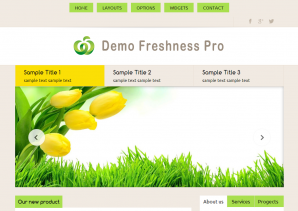 Freshness Pro is a great looking responsive ImpressPages theme. Give it a whirl on your desktop, laptop, tablet and mobile device. 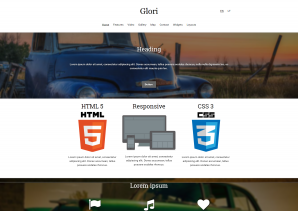 Hori is clean fast ajax based theme with horizontal navigation and unlimited color managment. The Package 102 include multipurpose responsive ImpressPages themes made for simplicity and ease of use. Customize layout, colours and backgrounds to clients taste. Bootstrap Pro Theme Version 1.08, this version fixes the inline responsive utilities to hide or show content on specific devices. 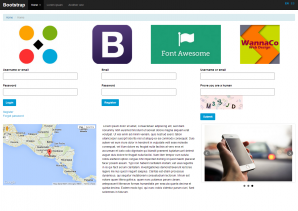 Bootstrap framework 3.3.2 , Popovers, tooltips, responsive tables and. The Bootstrap Pro theme includes 3 different skins within the Gallery widget which allows you to add an Image Slider with or without caption and also a carousel. It contains 3 layouts, left off-canvas menu and right off-canvas menu for devices smaller than 992px. Responsive tables, Responsive utilities and 3 different navigation bars that can be switched by going to the design tab. TinyMCE includes a plugin that allows you to add Popovers, tooltips and a standalone thumbnail with custom content. Study Pro is a simple and clean but still professional ImpressPages theme suitable for any business or portfolio, and it’s created by using the latest HTML5 and CSS3 techniques. Easily change the look and feel of your site with unique styles, a custom header, and unlimited color options. The theme Study Pro include three plugins - Slideshow Image, Social List and Carousel Courses. 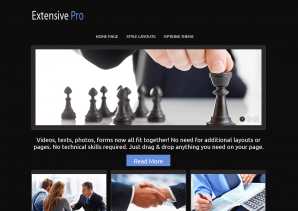 The Extensive Pro is a multi-purpose premium ImpressPages theme with a black, modern design with a big visual impact. Some of the other key aspects include: homepage slideshow, option theme colour and 4 layout styles. Badge Pro theme is responsive and fits all the web enabled devices and mobile browsers with ease. It runs on the new ImpressPages 4 with tons of backend customization config options. It comes in 4 styles and an interesting slideshow. Private Pro Theme include features - slideshow integration, 4 layout page style and color options to the theme customizable. 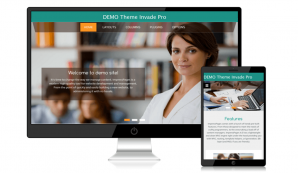 Creative Private themes are among the most popular theme types in a ImpressPages marketplace. It is clean, clear and beautiful. 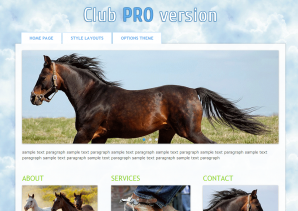 Theme Club Pro with a ton of incredible features - homepage slideshow and design another two layouts - right and wide style. The theme Club Pro is one of the best. It’s an elegant and lovely responsive theme so it look good on any device. Vinous Pro version includes homepage slideshow, three various layouts and theme color options. Drag & drop has never been this easy. Build page layouts with instant live previews: what you see is what you get, and it works on desktop, tablet, and mobile.